*Jason Roy suffered a finger injury while attempting a catch in 2nd ODI. He didn’t practice in net sessions on Monday. He will undergo a late fitness test tomorrow. *Roy chances of playing are very less, still, you can take a risk in GL. We will update more info we get any. *England have called James Vince and Sam Billings as back up for Jason Roy. James Vince replaces Dawid Malan in the squad. *James Vince underwent a long training session on Monday. So if Roy isn’t declared fit, Vince will replace him in playing lineup. James Vince is also coming from the good form in the domestic tournament. *No other changes are expected in English playing lineup except one forced change. *Bhuvneshwar Kumar took part in an optional training session today. He was steaming in without any signs of worry. Team manager has said that he will undergo the late fitness test after which final decision will be made. 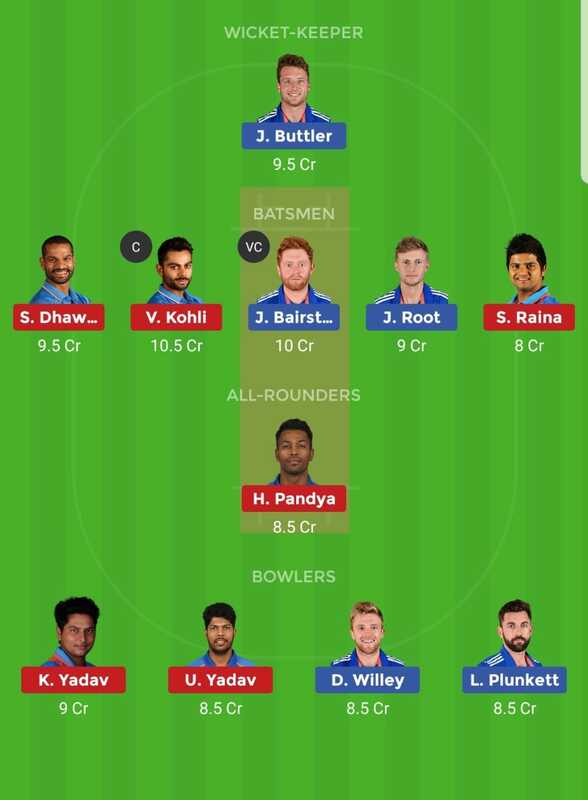 *Bhuvi has high chances of playing, and he will replace Sidharth Kaul in playing lineup. *No other changes are expected in playing lineup. **Pitch in past has been batting friendly. **Weather forecast is not that great for tomorrows match, with cloud cover and rain interruptions predicted in the match.